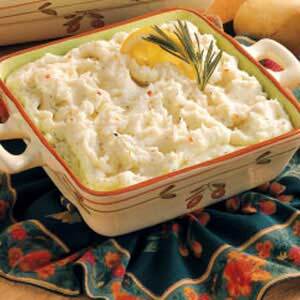 Potatoes are a staple at our house and this recipe is a favorite. Place potatoes in a large saucepan and cover with water. Bring to a boil. Reduce heat; cover and cook for 10-15 minutes or until tender. Meanwhile, in a small skillet, saute onion and garlic in butter until tender. Drain and mash potatoes; add the onion mixture, sour cream, dill, salt, rosemary, lemon peel and red pepper flakes if desired. Spoon into a greased 1-1/2-qt. baking dish. Sprinkle with paprika if desired. Cover and bake at 350° for 25 minutes or until heated through. Yield: 6 servings.